Following all the research I did for my presentation I came across two conclusions, 1) it wasn’t going to be easy to explain f.lux and its business implications in under seven minutes and 2) the lack of definite statistical proof that it is effective made me curious. So as a result, I decided that I would write a blogpost and conduct a mini case study to remedy both of my findings. First lets gain a better understanding of f.lux. 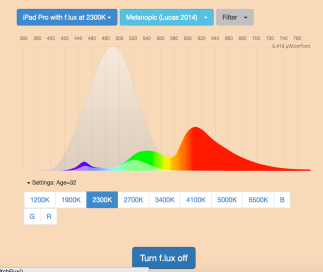 F.Lux was created by a software developer Lorna Herf and her husband, Michael, also a computer programmer. Lorna decided that she would spend time oil painting which led to them installing bright fluorescent lights in their apartment’s loft so she could paint at night. Having become more aware of differences in lighting, she noticed the clash of lighting between the bulbs and the computer screens. To minimize the discrepancy, they developed f.lux with the goal of mimicking the natural shifts in ambient light as closely as possible; transitioning from the bright, blue light of daytime to a dimmer, orange glow in the evening. After using it themselves for a while, they found it easier to wind down at night. This blue light they reference as culprit to their lighting issues is something that researchers have been studying for several decades (because it has been correlated to many different problems). 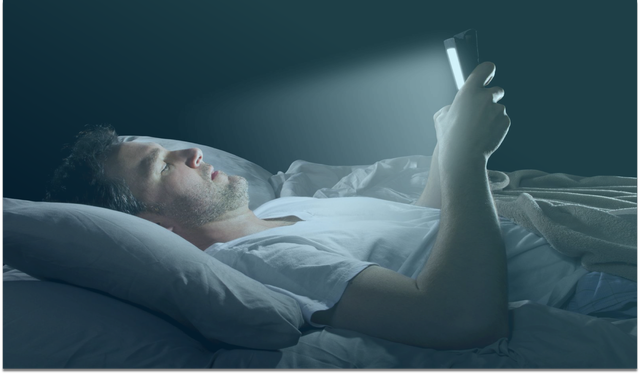 The blue light suppresses melatonin, which is the chemical that tells your brain to induce sleepiness at night. 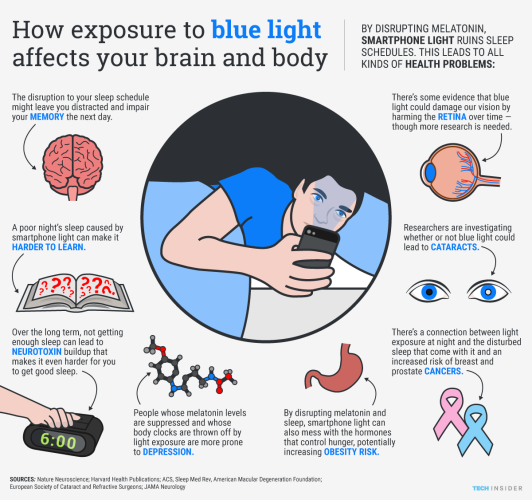 This blue light is emitted from all of our devices; in other words, staring at your screens before bedtime will keep you more alert when you would otherwise feel drowsy. 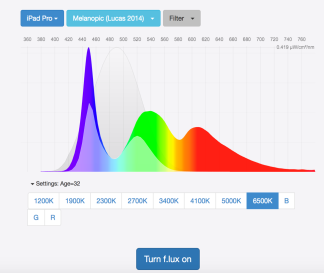 F.lux is a completely free software that you can download online for desktops and laptops (and before Apple’s Night Shift, onto jail-broken iPhone’s). It has been downloaded over 20 million times since its launch in 2009. In order to get it working, all you have to do is input what kind of lighting you have in your home as well as your location and f.lux will do the rest. Case Study: Does It Really Work? The premise of my mini case study was to control the sleeping environment as much as possible to attempt to get a more solid answer to whether f.lux is in fact effective. Many of the studies recorded suggested that they had no conclusive proof of it being effective because there were too many other factors that take impede one’s sleep. So I took two of my roommates as my test subjects (who will use f.lux) in addition to myself. I chose to have three subjects because one (we’ll call her subject M) has been using f.lux for 3 years so she’ll be test group 1, another (subject P) will be the second test group that will be introduced to f.lux during this week, and then I (subject N) will pose as the control group who will keep doing the same things I do on a daily basis before bed. The controlled variables for the two test groups include all being girls, eating dinner at the same time of night daily for a week, consuming the same amount of water before bed during the week, disconnecting from devices 90 minutes before bedtime and not having outside stress (a test or complex assignment due that week); an attempt to normalize the outside factors towards sleeping patterns. The reason for having two test groups with the same controlled variables is to determine whether using the software as a new user versus a mature user has the ability to skew the results as the software being effective. After a week of observing all three subjects, the results were extremely positive. Subject M continually demonstrated feeling less alert about 45 minutes before falling asleep. Subject P demonstrated the same grogginess about an hour before falling asleep for the first 3 days and then began to experience delays in alertness about 30- 45 minutes before falling asleep for the subsequent days. Subject N, after continuing normal behavior before bed, exhibited grogginess on average an hour after subject P and M were asleep; this varied a little daily, between 45 minutes to an hour after, however it was always conclusive of less sleep time overall. Again because I am not a scientist, I cannot say that these results are verdict of it being a successfully effective software, however, it follows through with the positive results all the other case studies showed. Moreover, once subject P was no longer being observed, she didn’t use the software anymore (out of laziness) and her sleeping habits converged towards that of subject N. I found this result to be somewhat telling of effectiveness, however since everyone’s influential factors differ greatly, it is hard to say. How Does Sleeping Less Affect You in the Workplace? Regardless of the results, it is apparent that using devices is correlated (at the very least) with less sleep. And less sleep is conducive of being less effective in the workplace. Coming from a bunch of college seniors, we think we’re invincible and can last on 4 hours of sleep (very very wrong). Lack of sleep affects motivation to learn, generation of new ideas, understanding new concepts, ability to manage competing demands, and to stay focused in meetings and daily activities. The estimated lost productivity due to poor sleep translates to cost about $3,156 per employee, which can be over $54 million a year for larger companies. According to a study performed by McKinsey, the organizational cost of insufficient sleep is high. 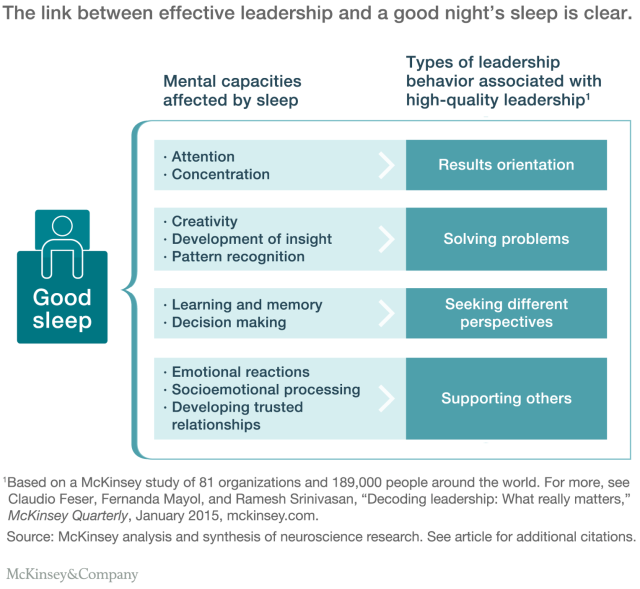 Lack of sleep especially effects those who are in leadership positions and those working in teams; think about it, cranky bosses or people you need to collaborate with are not fun to deal with. So because of the lack of conclusive statistical evidence in my mini study (maybe it’s due to sample size), leave your comments below on if you’ve used f.lux or started to and what effects it has had on your sleeping habits. Or if none of this applies simply leave your thoughts on it!